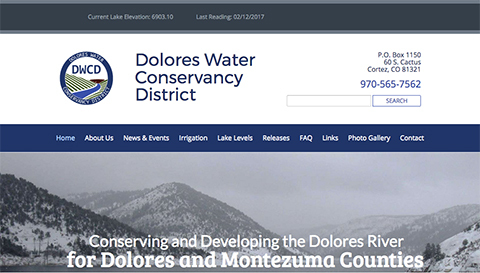 Cortez Web Services worked with the Dolores Water Conservancy District to create a modern, responsive new website with a custom content management system for displaying lake elevation readings, posting meeting dates and minutes, and announcing news and events related to water releases and more. The custom CMS was built to make frequent content updates easy and efficient for the Dolores Water staff through the development of a customized back end for website administration, and the use of custom post types. The new site contains many dynamic features, and is completely responsive, so it looks great on different sized screen and mobile devices.